The site is on a busy pedestrianised area on the sea front in Weston Super Mare and was being converted in to a French Bistro / Brasserie. The building is of circular construction over two floors with the roof being constructed of Glulam beams giving a spoked bicycle wheel design. 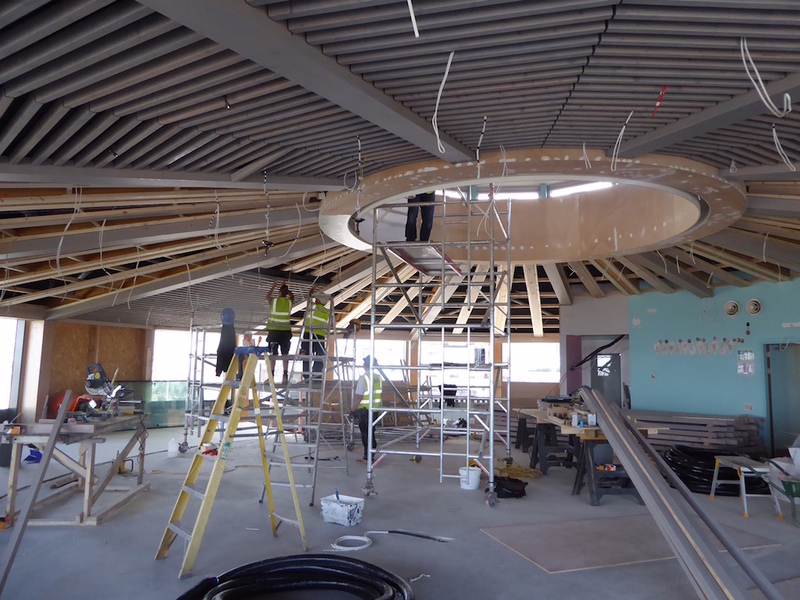 The designers came up with the idea of infilling the wedges between the Glulams with graduated lengths of timber strips 2300 meters in total which required fire proofing prior to having a decorative coloured wax and oiled finish applied which continued on to the glulam beams. We set up a production line using trestles to stack the timber between coats, thankfully we were able to apply the finishes prior to fixing of the timbers. 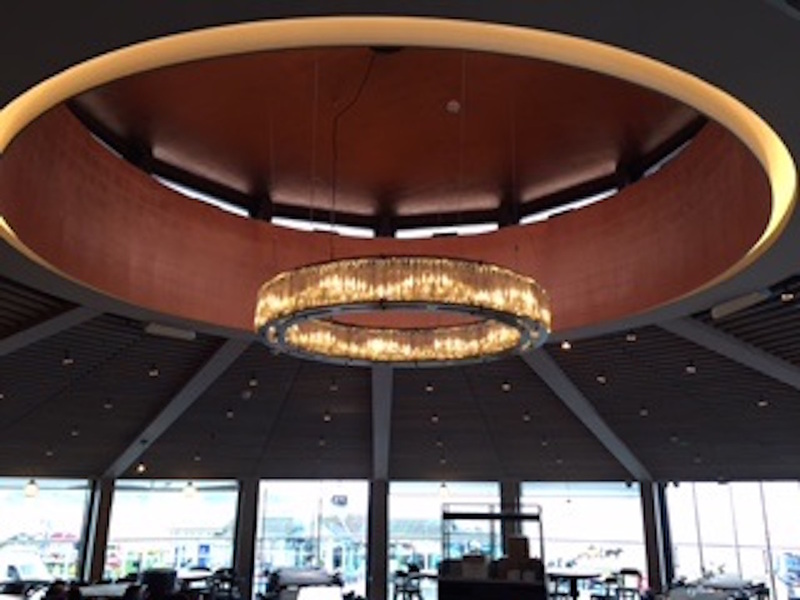 In the centre of the ceiling was a domed feature with a cylindrical drum surrounding it, the client expressed the desire to have the dome & drum decorated in a metallic finish but after various trials with metallic paints the end result was not satisfactory. The design team then came up with the idea of applying copper leaf to the ceiling and after 10 days of pain stakingly applying over 2000 squares of delicate copper leaf from a tower scaffold the end result was stunning. This was one of the most labour intensive and delicate projects we have ever undertaken but the end result was amazing and we take great pride in the care and expertise our decorators showed while carrying out this work under building site conditions, overall the decoration of both elements of the ceiling took over 600 man hours but the end result was applauded by all. 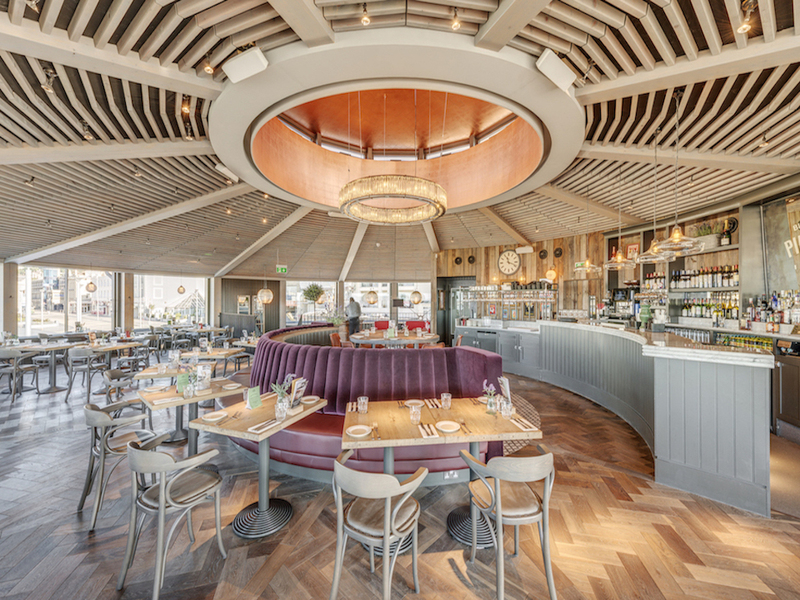 The finishes throughout the restaurant have been very well received by the Client, Designers & customers and has resulted in the successful procurement of the next 3 sites for the chain. This work has been entered into the Painting and Decorating Association (PDA) trophy awards 2017, in the 'Highly Decorative' Category.